Question Time, the BBC's premier political debate programme comes from Basildon on Thursday 28 January. The panel are the Secretary of State for Culture, Media and Sport Ben Bradshaw MP, the Conservative peer Lord Lawson, the Liberal Democrat Baroness Tonge of Kew, the columnist Jane Moore and the journalist and writer Douglas Murray. 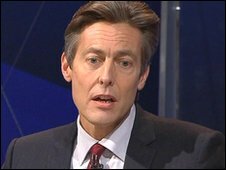 Ben Bradshaw is the Secretary of State for Culture, Media and Sport. He was promoted to the cabinet in June 2009 and has held a number of other ministerial jobs, including at the Foreign Office and at the Department of Health. He worked as a journalist before entering politics, covering the fall of the Berlin Wall as a reporter for BBC radio, and winning the Sony News Reporter Award in 1993. This week, he stated that "to claim the (Edlington) case shows Britain is 'broken' or 'morally bankrupt' is wrong and not supported by the evidence". 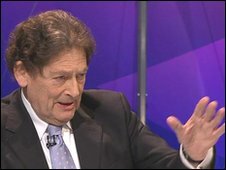 Nigel Lawson is one of the most famous politicians from the Thatcher era and remains a senior figure in the Tory party. He became MP for Blaby in Leicestershire in 1974. In government from 1979, he was secretary of state for energy from 1981 to 1983 when Margaret Thatcher appointed him chancellor of the exchequer, a post he held until 1989. He became Lord Lawson of Blaby in 1992. Lawson is founder and chairman of the Global Warming Policy Foundation and is a well-known climate change sceptic. His children include Dominic, former editor of the Sunday Telegraph and TV cook Nigella. Lawson recently stated that "The right way to tackle the disastrous nature of public finances is to be as tough as you can, from day one, on public spending. You may well need to increase taxation as well." 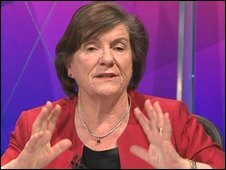 Jenny Tonge is a Liberal Democrat member of the House of Lords. She was Liberal Democrat Member of Parliament for Richmond Park in London from 1997 to 2005. In May 2005, she became a life peer, becoming Baroness Tonge of Kew. She is a former doctor and is known for her outspoken views, in the past arguing that cannabis should be legalised and heroin "medicalised", to treat more addicts on the NHS. In 2004, she was asked by the then Liberal Democrat leader, Charles Kennedy, to quit his front bench following sympathetic remarks about Palestinian suicide bombers. 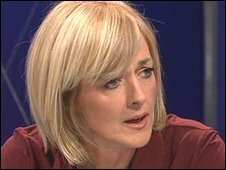 Jane Moore is one of the UK's best known columnists, writing for the Sun since 1996. She also writes for the Sunday Times, and is the author of a number of bestselling novels. In television and radio she has presented the daily breakfast show on LBC and co-presented Loose Women. Moore has also presented political debate shows Central Weekend and Thursday Night Live. She is the team captain on the critically-acclaimed BBC comedy Annually Retentive, starring Rob Brydon. Writing about the Edlington Case in her column this week, she is supportive of maintaining the boys' anonymity, stating that "the 'Devil Boys' must not be named". 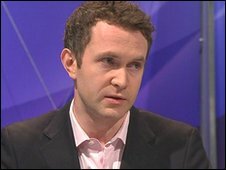 Douglas Murray is a journalist and writer, who is the director of the think tank, Centre for Social Cohesion. He was recently described in the New York Sun as "Britain's only neo-conservative". His book, Neo-conservatism: Why We Need It, was hailed by historian Andrew Roberts as "the Right's answer to Michael Moore", and his comments about the rise of extremist Islam in Holland have led to his needing police protection when visiting the country. "Islamophobia", he has said, is a nonsense term...it's not 'phobic' to be worried about Islam. It is eminently rational."